What difference does it make how well you kick if you can kick well only after warming up? Your kicks, like your punches, are supposed to be your weaponsalways accessible and ready. You would not carry a gun disassembled, would you? You would not count on having the time to put it together while facing an attacker. And yet . 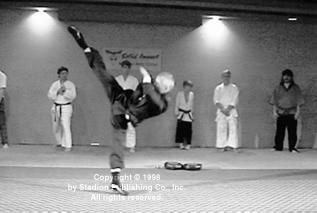 . . how many people practice kicks, especially high kicks, and can't use them right away without first warming up and stretching? If you want to increase the height of your kicks and to be able to reach that height with no warm-up, you need to develop the right kind of flexibilitydynamic flexibility. Dynamic flexibility is the ability to perform dynamic movements within a full range of motion in the joints. Kicks are dynamic movements. Dynamic stretches for kickers are simple leg raises in all directions. First develop the ability to move your limbs with moderate speed within a full range of motion in the joints. You should start at a lower extension (height) to avoid injury from any sudden contraction of rapidly stretched muscles. Do not throw your limbs; rather, lead or lift them, controlling the movement along the entire range. Then, after you have reached nearly your full range of motion, you can increase the velocity of the limb so the last few inches of its trajectory will be less controlled but the stretch will not be sudden. Do leg raises to the front, back, and sides. Make 12 repetitions in every set and do as many sets as you need to feel you have reached your current limit of flexibility. If you rely on high kicks as your combat techniques and want to do them anytime without warm-up, you should do dynamic stretches twice a day. Research has shown the effectiveness of dynamic stretching twice every day (Matveev 1977). First spend a few minutes in the morning (before having your breakfast) on the dynamic stretching of your legs and then later during the day do dynamic stretches again. On days you have your workout, do these dynamic stretches in the warm-up before kicking. Starting slowly, you should gradually raise the legs higher, and then you should increase the speed of your movements. Doing the actual combat kicks in this morning stretch is not necessary to be able to do them later in the day without a warm-up. According to Matveev (1977), eight to ten weeks is sufficient time to develop maximal dynamic flexibility. Yes, you can have great dynamic flexibility in a matter of a few weeks and then display it even without a warm-up. All it takes is the right stretching method. Spending several months on developing your flexibility and not being able to use it without a warm-up indicates either that the stretching method you use is incorrect, you are chronically fatigued, or both. 1) Incorrect methods of teaching skills, which may result in too many repetitions of a given exercise and chronic local fatigue. 2) Training loads that are too great and not enough rest. If you begin your workout still fatigued or even sore after the previous one, you are asking for an injury, or at least you hamper your further progress. 3) The wrong sequence of efforts. If you use the wrong sequence of efforts (exercises) in a workout or in a set of consecutive workouts, it may double or triple your recovery time (Kurtz 1994, p. 64). Now, how about all those static stretchessplits, for exampleso many people try to do before kicking? Don't! Never do static stretches before dynamic stretches, kicking, or any other dynamic movements. For several seconds or even minutes following any type of static stretch, you cannot display your top agility or maximal speed because your muscles are less responsive to stimulationyour coordination is off. Static stretches reduce the force production of the stretched muscles. This was shown by subjecting calf muscles to several 30-second stretches and measuring their force afterward (Rosenbaum and Hennig 1995). Maximal force production is impaired for several minutes after strenuous static stretching (Kokkonen, Nelson, and Cornwell 1998). If you try to make a fast, dynamic movement immediately after a static stretch, you may injure the stretched muscle. I explain these and other reasons in Stretching Scientifically (Kurtz 1994). In choosing stretches, you should examine your needs and the requirements of your activity. For example, if you are a kicker, you need mostly a dynamic flexibility of hips. To increase your range of motion, you need to do dynamic leg raises in all directions. The principle of specificity states: Flexibility is specific to the speed of movement. Flexibility is also position specific, so static exercises or stretches like splits are not very useful if you want to kick higher (a display of dynamic flexibility). According to Logan and McKinney (1970) the principle of specific adaptation to imposed demands in the case of flexibility means that eventually, either at the end of the first set of dynamic stretches or in other sets, you should stretch at a velocity not less than 75% of the maximal velocity used in your actual skill, a kick, for example. A common sight in training halls, gyms, dojang, or dojo, is someone standing and holding up the leg. Such standing, while requiring and developing static balance and static strength, is not developing dynamic flexibility nor dynamic strength. It is developing a static active flexibility required from gymnasts but not something that kickers need. Such leg holding requires a strong tension of the muscles on one side of the trunk when the lower back is twisted to this side and pulled forward by the psoas muscle on the same side. This, if done by someone with insufficient lower back strength or any back problem, can lead to lower back strain or intervertebral disc inflammation. As far as strength is concerned, the specific strength for a kicker is the strength that lets one pack a wallop in a kick, not to hold up a leg! Specific strength for kicking is developed by kicking a heavy bag, kicking into layers of sponge, kicking with bungee cords attached to legs and doing other dynamic exercises similar to kicking. Strength, just like flexibility, is specific to the speed of movement, its angle, and range of motion. This is explained by McArdle, Katch, and Katch (1991). You cannot learn dynamic skills well by using static exercises, and vice versa. There is more to throwing high kicks without any warm-up than the right type of stretching. In the next column you will learn the little details of kicking techniques that let you kick high and with power without a warm-up. Logan, G. A. and W. C. McKinney. 1970 Kinesiology. Dubuque, IA: Wm. C. Brown Company Publishers. Matveev, L. P. 1977. Osnovy sportivnoy trenirovki. Moskva: Fizkultura i Sport. McArdle, W. D., Katch, F. I., and V. L. Katch. 1991. Exercise Physiology: Energy, Nutrition, and Human Performance. Philadelphia, PA: Lea & Febiger. Rosenbaum, D. and E. M. Hennig. 1995. The influence of stretching and warm-up exercises on Achilles tendon reflex activity. Journal of Sport Sciences vol 13, no 6, pp 481-490.